If based off B.A.P's past work, you were convinced they couldn't pull off a heavy-based hip hop track 'whut's poppin' is sure to change your mind. The song totally sets the stage for whats to come from this EP. Bang Yongguk & Zelo totally owned their rap sequences, sounding very confident and secure with their roles as lead rappers within the group. And while the rapping does sound excellent ... Himchan, Daehyun, and Jongup also bring a level of stability just by adding their vocal talents to the tracks. The only issue I have with this song is that the end feels rushed, like someone decided that it was time to pack up quickly and leave everything behind....but dont let that take away from the fact that its a good song. Daehyun starts this track off in a strong way. His voice has definitley come a long way in regards to blending in seamlessly with Bang Yongguk and Zelo's rapping. Seaking of which, Bang Yongguk's rapping is particularly powerful through out the entire song. Now this song is very unique. Not only does it consist of rapping AND singing, they threw in some interesting electro breakdown parts as well. At first these sections were annoying, but the more I listened to the song, the more fond of those sections I became. There used to be a portion of this song that I thought I could live with out forever . . . if you go ahead and skip to the 2:53 mark, for some god forsaken reason, someone decided that it would be a grand idea to drop Yongguk's voice (a voice that is already known for being ridiculously low) another 2 octaves lower. I found it atrocious because you can hardly even understand him . . . . ok, ok, ok ... I can't "understand" any of what they're saying but thats totally besides the point BUT! like any committed BABY even that section grew on me. 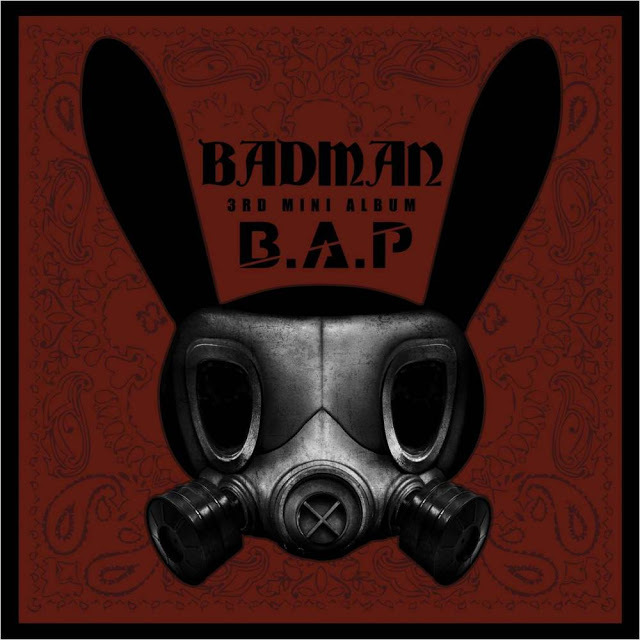 The part following that section is probably one of my favorites, I LOVE the way they sing "Badman" after each of Youngguk's parts. It has a very unique sound to it, it almost sounds like a hindu prayer of sorts, and yet it flows together very naturally with the rest of the song. Love this song! It's exactly what I've come to expect from B.A.P. It starts off with strong rap sequence from Zelo right off the bat really set the tone for this song. The chorus of this song is type you just wanna sing along with, and the rest of the song (which is mostly rap) makes you want to move to the beat regardless of if you can sing along or not. Daehyun, Jongup, and Youngjae once again make it sound easy for them to match Zelo and Yongguk's raps. Unfortunatly Himchan seems to be overshadowed in this track, he does sing, but it's only during the second half of the chorus and he sings it with Yongguk so you dont get the chance to hear him on his own. wow . . . . . . just . . . wow This is nothing like anything B.A.P has ever done before. The track is excellent, the whole thing has a very Jazzy feel to it, yet B.A.P is able to make it into their own with a style I call "Yongguk's talk rap" then 9like in the rest of the album) the style transitions seamlessly back into Daehyun's singing. I can't understand a damn thing they're saying at the beginning of the song, but they way Yongguk interacts with the unknown female (who I'm just going to assume is one of their sunbaes from Secret) just makes me smile. The rest of the song is pretty mediocre, its not bad but it doesn't stand out like some of the other tracks. The only reason i'm giving it 4/5 and not 3/5 is because of the intro. It's no secret that Bang Yongguk is at the top of my B.A.P bias list. The Loof is on fire" The Roof is on fire"
Which, while annoying to any native English speakers, is totally understandable considering the Korean language pronounces the English letter "R" closer to an English "L" or "D" depending on the situation. Thankfully they were able to get the right pronunciation for the EP release. Actually aside from that minor error, the English in this song was damn near perfect. Overall, I think this album will be either "a hit or miss" for a lot of people. Even I had to take a moment to really enjoy this EP . . . And my "BABY" status is a serious rival to my "E.L.F" status. I always thought SuJu would forever be at the top of my bias list, if only cuz they were the first K-pop group I really was introduced too . . . . . . .
Buuut I've been following B.A.P since their debut . . . actually, if I think about it, they were the first group I started following since the start of their career. so I guess this means SuJu has some serious competition for the top spot. poor EXO never even stood a chance *sigh* there was nothing they could do to stop it too . . . But!!! don't worry . . . you'll always be my ultimate bias. I seriously doubt that will EVER change. yeah . . . . that's never gonna change. Ahh...that Siwon "Surprise" gif....totally priceless. I wish I could just put stuff like that on my phone for spontaneous viewage because...I can't imagine that not making me smile when I need a pick'me'up. Holy hell it was great! The Siwon gifs are great! I'm with Aunnie, that last one needs to be on phones. Its a "pick me up" for sure.